In 1869, Methodist ministers from the North who had come to South Carolina as missionaries to the former slaves, established Claflin University. The school was named in honor of the family of Lee Claflin, a wealthy Methodist layman of Massachusetts. In addition to northern missionaries, the board of trustees included prominent black South Carolinians. Although it was chartered as a university, in the early years, Claflin, of necessity, provided a basic grammar school education for the Freedmen. In the early 20th century, Claflin provided hundreds of students from all parts of the state with a high school education. The name of the school was changed from Claflin University to Claflin College in 1914. In 1922 Dr. J.B. Randolph became the first African American president of Claflin. In the following years, as public education improved somewhat, the number of college students increased and the high school and grammar school courses were discontinued. Numerous graduates achieved prominence in medicine, the ministry, and other professional fields. The education of teachers was a primary goal of the school, which provided teachers for public schools throughout the state.Historic buildings on the Claflin campus reflect the development of the school in the last years of the 19th and the first two decades of the 20th centuries. These include Lee Library (1898), Tingley Memorial Hall (1908), Trustee Hall (c. 1910), Wilson Hall (1913), and the Dining Hall (1913). 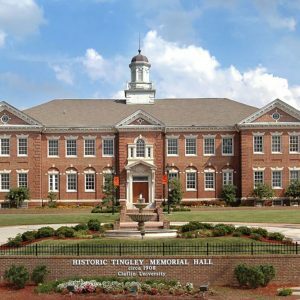 Lee Library and Tingley Memorial Hall were designed by William Wilson Cooke, superintendent of vocational training at Claflin and a pioneer African American architect in the nation.